With the new all-new 2011 Ford Explorer being recently unveiled, the truck based Explorers are soon becoming a fading memory among new SUV buyers as the current inventory exits the Ford dealership lots. 2010 is the last model year for the truck based Explorer which has been a very successful run of 20 years. The Ford Explorer was marketed originally as an adventurous family vehicle that could go anywhere. As a tribute to its last year I decided to drive a 2010 Explorer through one of the most beautiful areas of the continental United States – a trip up the majestic California coast from the Mexican border to the beaches just west of Los Angeles. This trip was intended to be a fitting retirement party for Ford’s workhorse SUV. 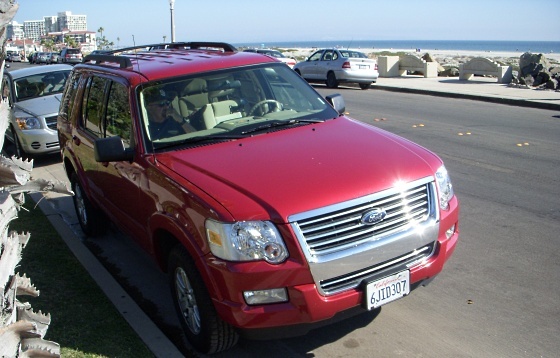 Selected for the trip was a red 2010 Ford Explorer XLT which was only moderately equipped with options and the base 210 horsepower 4.0 liter SOHC V6. This XLT was not equipped with leather seats, satellite radio, sunroof, factory navigation system, or any other upscale option. Besides the bright red exterior color this Explorer was a plain Jane like many other Ford Explorers sold over the years. Like all fine trips they must start somewhere, mine started when the Explorer rolled into Imperial Beach, the California beach that touches the Mexican border. It’s the most southwesterly city in the continental U.S. It’s a residential beach with not many hotels and modest residential homes. It’s symbolic of the California beach communities of yesteryear, in other words it’s a step back in time before modern commercialization which has hit many U.S. communities. 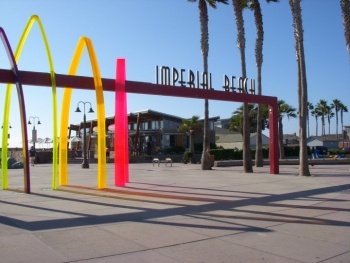 Imperial Beach weather like most Southern California beach communities is heavenly all year round with its mild Mediterranean like climate. It’s also a suburb of San Diego being only a short 14 miles from the large city. On the southern end of the beach (on a clear day) a view of the western coastal side of Tijuana Mexico can be seen. On this border area located in Imperial Beach is the Tijuana Estuary which is a marshy wetland area that is home to many rare birds. 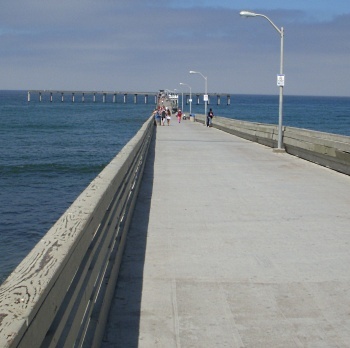 However Imperial Beach’s most famous landmark is the Imperial Beach Pier, an old style wood plank fishing pier. Walking along the pier is a flashback in time; people are fishing and walking. The view and scent of the Pacific Ocean made the walk to the end of the pier worthwhile. After taking in the sights at the wooden pier it was time to move up the coast on Route 75 (Silver Strand Boulevard). This drive is a nice ride on a narrow stretch of land very similar in width to the narrowest portions of North Carolina’s famous Outer Banks – on one side the Pacific Ocean can be seen on the other San Diego Bay. This particular day like many in this area, it was a sunny 70ish degree Fahrenheit which was more suitable for driving a new Mustang convertible however I made due as best as I could by putting down all four of the Explorer’s side electric windows so my face could be hit with the refreshing cool air whisking off the Pacific Ocean. I really appreciated that Ford engineered the side rear windows to go down all the way into the door unlike many new SUV windows which only partially go down into the side doors. The Silver Strand Boulevard led the Explorer to the next destination, Coronado Island, which most have never heard of however many have seen. Seen on the TV or big screen that is, Marilyn Monroe became one of the biggest Hollywood stars of her era after the release of the movie Some Like It Hot. 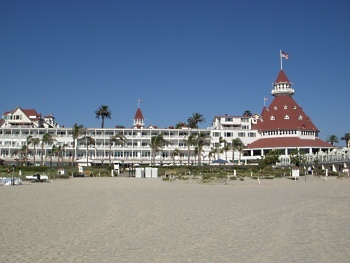 The beach and hotel scenes in the movie were filmed on Coronado Island and at the Island’s famous Hotel del Coronado which first opened for business in 1888. At the time it was the largest resort hotel in the world. It was also the first hotel to use electrical lighting. Its beautiful setting right on the Pacific Ocean, luxurious appointments, and Victorian styling have attracted many famous visitors over the years. Most U.S. Presidents in the last 100 years have been guests of this hotel. Coronado Island like Imperial Beach has a lot of residential housing and Mom-and-Pop style shops and restaurants however Coronado Island is more upscale. There are a few big chain stores on the island such as Vons however these chains blend nicely with the local favorites – there are no unsightly signs or billboards. Coronado Island has many beautiful homes especially those on mansion row right next the Hotel del Coronado. All the yards on the island are perfectly manicured. What makes Coronado Island such an interesting place is that the Island is a combination of residential neighborhoods and a military base. The north end of the island is home to the North Island Naval Complex which features a large airstrip. For those who like to plane watch; from the main beach you get a close view of incoming and outgoing jet fighter planes and an occasional military cargo, transport, or passenger plane. It’s like your own personal air show. After the Coronado Island experience the Explorer continued on Route 75 across the San Diego – Coronado Bridge which first opened in 1969. This 2.1 mile long bridge has 200 feet of clearance above San Diego Bay. This was the same bridge that the early third generation red Camaro Z28 from the Simon & Simon TV show can be seen cruising across during the opening credits. It was on this bridge that I could briefly feel the Explorer’s smooth 4.0 liter V6 being taxed as it went up the bridge’s steep incline. By the time the Explorer reached the apex of the bridge all that could be seen were the wonderful views of the San Diego Skyline and San Diego Bay. After a brief jaunt north on Interstate 5, it was off to Ocean Beach or O.B. as it’s called by the locals. Ocean Beach which is within San Diego city limits is one of the older small California coastal communities. It’s a quaint little community with older houses many of which were built before World War II. Ocean Beach is also home to the longest pier on the U.S. West Coast. The Ocean Beach Pier is 1971 feet long which is approximately 1/3 of a mile in length – long enough to accommodate more fisherman than most can imagine. However the length gives one a feeling at the end of the pier of being miles out into the Pacific Ocean. The beach at O.B. may be short in length however its unique contours which include a beautiful rock formation certainly make up for this shortcoming. The next beach up the coast is Mission Beach which is picturesque beach that spans almost two miles in length, is home to two boardwalks – one on the ocean side and the other on the Mission Bay side. Belmont Park, an amusement park that first opened in 1925, is located at the south end of the beach and is a time warp back to the roaring 1920s. The main attraction is the Giant Dipper a wooden roller coast that debuted in 1925. Ironically across the parking lot from the park is the latest in modern technology – the Wave House which is home to the Flowrider – a state of the art wave ride that’s leagues ahead of your standard wave pool. 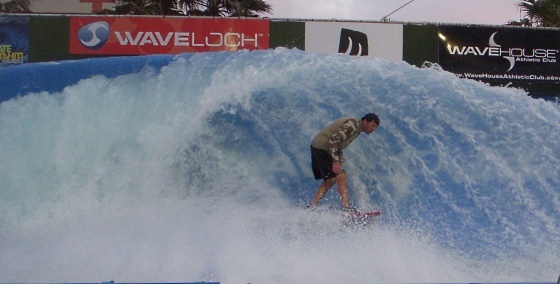 The day I arrived the Flowrider was pumping out a full blast of water simulating the perfect big wave tube which eager riders tried to master but most failed. Soon my stay at Mission Beach came to a close and the Ford Explorer was en route up the coast on Interstate 5 to the beaches of Los Angeles. 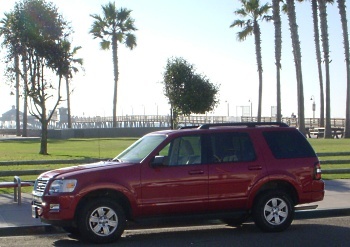 This article continues with Part 2: Coastal Southern California Ford Explorer Crusade .